The only MOBILE WATER INJECTION MC-331 prop in the United States of America! We now offer RESPONSE TOOLS! Propane Flare on the Market! 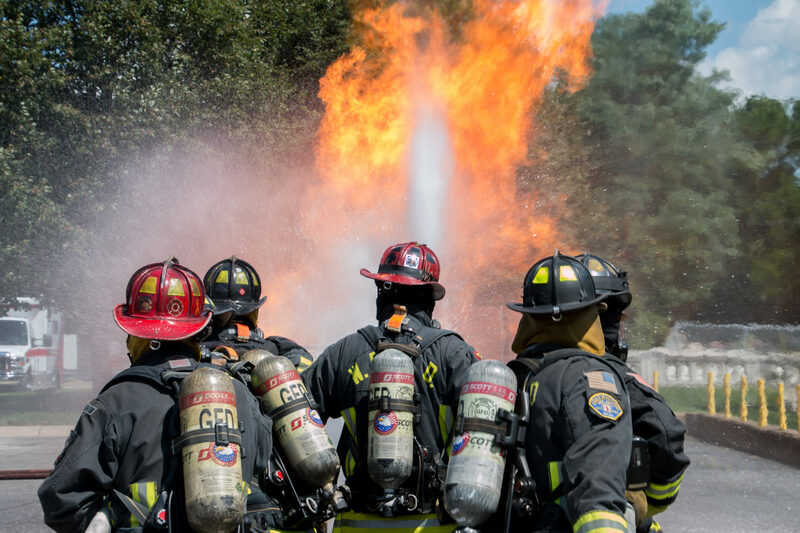 Responder Training Enterprises (RTE) started providing fire service training in the 80’s that included firefighter basics, fire investigations, tactical rope and Emergency Response to Propane Incidents, including Propane Flare operations. 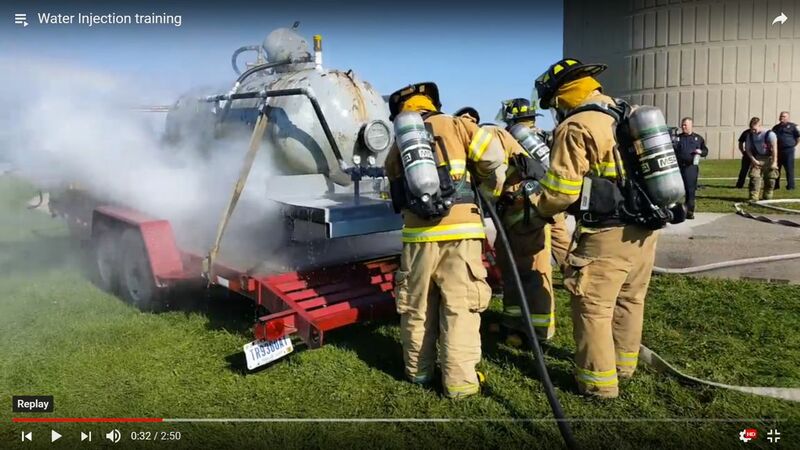 RTE is the only Indiana based company that’s provided a mobile Live Burn Propane course with classroom and practical evolutions for over 25 years. 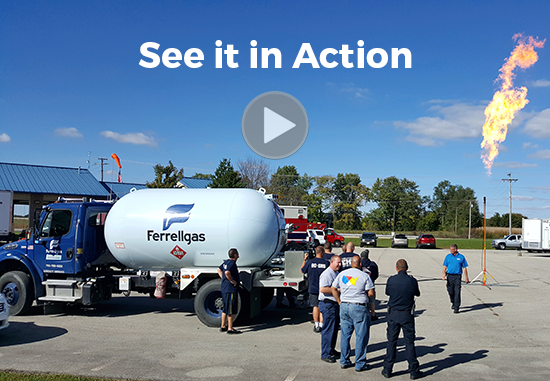 With 14 years in the propane industry and 30 in the fire service, the company’s owner has the response and service knowledge that’s practical and available to everyone that is willing to receive it. Most of our courses are deliverable wherever you need them. Since its inception Responder Training has continued to abide by its commitment to customer service and support. And now we have added response tools to our offerings. Aptly named, “THE PROPANE FLARE”, our flare is the first 1 inch commercially available propane flare intended for first responders and service agencies. The Responder propane flare has been created to move large volumes of propane using industry standard 1 3/4” ACME connections, 1” full flow hose, pipe and fittings. Using full 1” components throughout, “THE PROPANE FLARE” can flow more that twice the capacity of others. “THE PROPANE FLARE” and the additional connection kit allows you to switch between an assortment of cylinders, tanks and piping systems with no tools required reducing time and the potential of leaks. Our new “Emergency Water Injection” kit offers you an option that most have never even heard of. What if you could convert a liquid propane leak to water? Doing so reduces or eliminates the expanding vapor down to a safer level almost instantly allowing you to extricate trapped victims, find the leak or just manage it until the product can be burnt off. Propane weighs about half the weight of water, and like oil propane will float under the right circumstances. Click on SHOP and check out the “Emergency Water Injection” kit and give us a call if you have additional questions. 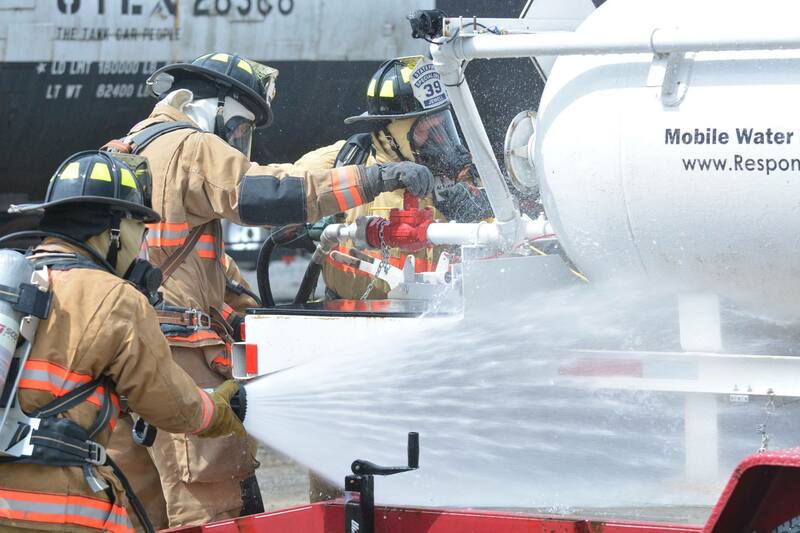 The New York Special Operations Branch, NYS Division of Homeland Security & Emergency Services has increased their propane response capabilities by adding 3 1-inch propane flares and 3 propane water injection kits. 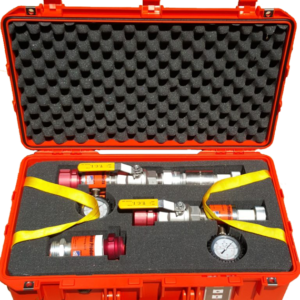 We would like to thank Bob Royall and the Harris County Hazardous Materials Response Team (Texas) for their purchase of a Water Injection Kit. We would like to congratulate the City of Macclenny Fire Department FL for their purchase of a Water Injection Kit. “THE PROPANE FLARE” provides you with the tool necessary to move large volumes of propane using industry standard 1 3/4” ACME connections, 1” full flow hose, pipe and fittings. With a full 1” flow capacity throughout, “THE PROPANE FLARE” can flow more that twice the capacity of others. 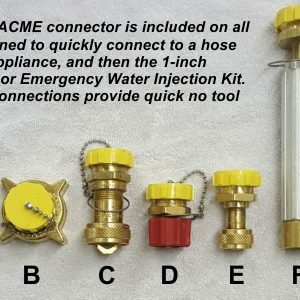 “THE PROPANE FLARE” and the additional connection kit allows you to switch between an assortment of cylinders, tanks and piping systems with no tools required reducing time and the potential of leaks. The unit folds for storage and transport in a storage bag making it quick and easy to deploy when needed. Standing a full 10 foot tall and with four 4’ legs, the flare has over 64 sq ft of stable base that won’t require staking or sand bags under normal conditions. 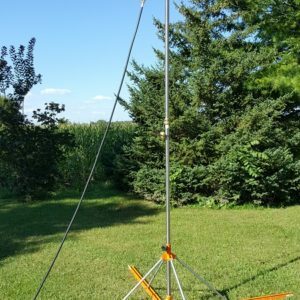 For those times when the emergency or job site is just not flat, the base has been designed to allow the flare to be set up on up to a 20 degree slope and still maintain a vertical flare. The system requires no electricity for operation making it perfect for remote locations. The main burner and Pilot Flare Assembly are constructed using 304 Stainless Steel that is not susceptible to flame damage from liquid rundown. “THE PROPANE FLARE” has been designed by a 30 year firefighter/hazmat tech with 14 years in the propane industry. It’s intended to be a lifetime response tool that will outlast your career. 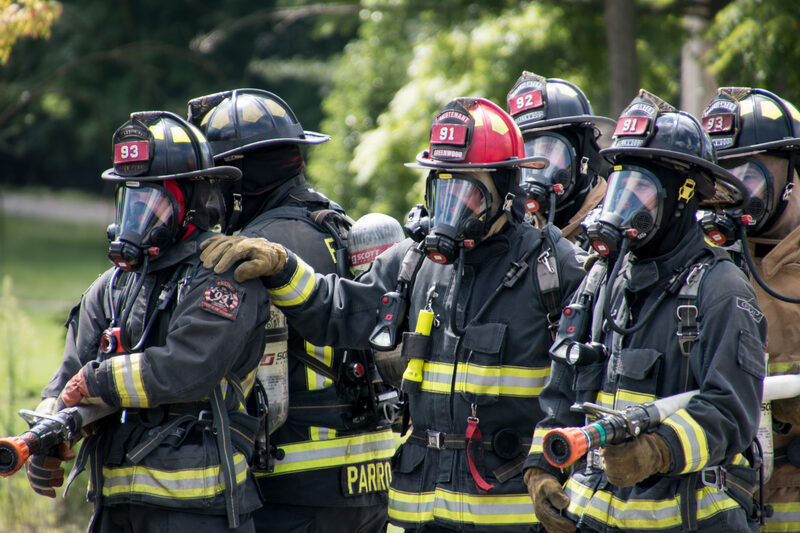 When you need a flare for an emergency situation, time and temperature are not on your side, the ability to flow larger volumes liquid and higher vapor capacities are a must. 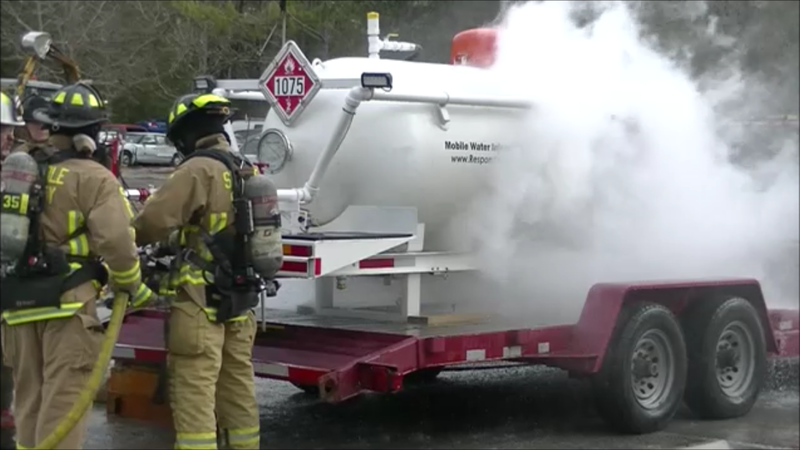 “THE” PROPANE FLARE is recommended for Fire Departments, HazMat teams, rail crews, propane dealers and anyone else that needs to safely reduce the volume of liquid or vapor pressure in a system.